This isn’t another post about about common designer qualms. Requests such as “could you make the logo bigger?”, “can it be more blue?” or even the dreaded “I think it’d be better in Helvetica” are frustrating, but they pale in comparison to the ‘C’ word. Content, or rather a complete disregard for it, is for me the single most infuriating aspect of designing websites. I’ve worked with a ton of small and medium-sized businesses operating in a range of different industries and the one thing that unites almost all of them is that they still don’t get content. Few can provide anything more than shoddily written copy taken from an old website and nobody has a content strategy. To a web designer, poor web copy is irritating but it’s a start and it can be turned into something much better. What is much more frustrating is a business’s inability to create new content after a new website is live. Without a plan for the continued publication and marketing of content, designing a website today often feels almost pointless. Commissioning a new website without a solid content plan is akin to buying a brand new car and neglecting to buy any petrol. 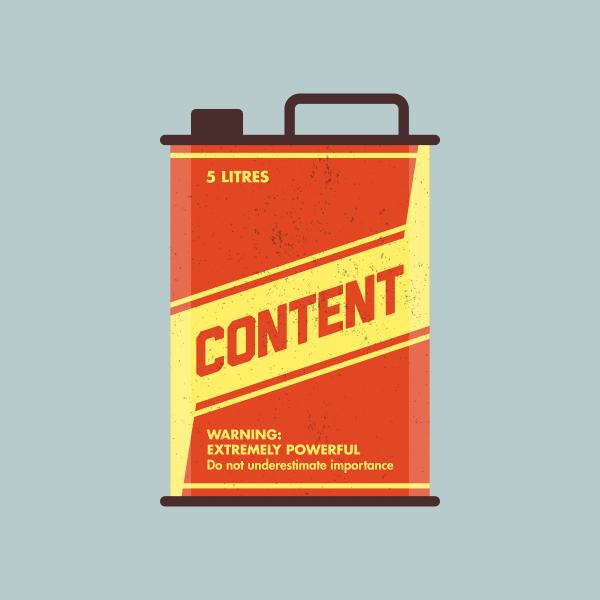 Good content is fuel — it’ll take you places. It’ll drive website traffic, increase brand awareness and ultimately increase business. 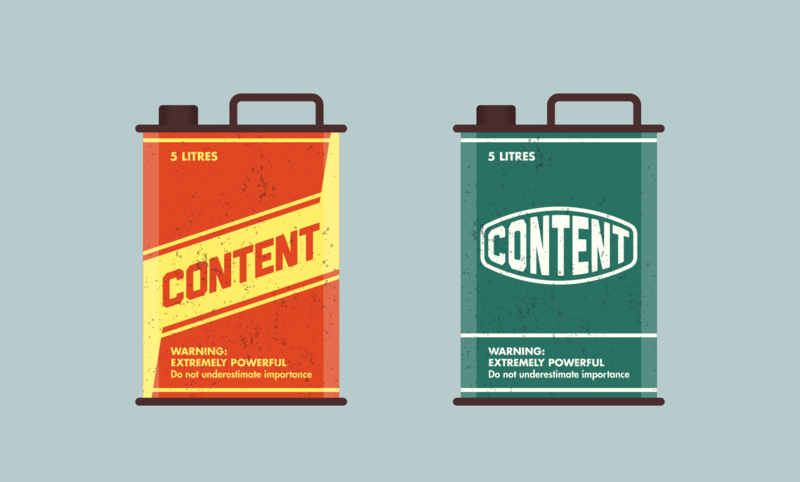 This fuel needn’t be more than a regular injection of engaging information — otherwise known as content marketing. Content marketing can include many things; The Lego Movie is one of the most most extravagant examples. But you don’t need a film script and millions of dollars to reap the benefits of great content; a simple blog area of a website can suffice. Many smaller enterprises fail to realise that creating and distributing compelling content is one of the most accessible means by which any business can market themselves. There are lots of companies out there that don’t need to blog, but their’s is rarely one of them. Content marketing is not about the hard sell; it‘s about connecting with an audience by giving them something in order to build trust and respect. Modern web users are very wary of anything that tries too hard to sell-sell-sell. Creating compelling content requires research and consideration. Why would somebody take several minutes out their day to read a couple of hastily written paragraphs when they can read twenty other articles that approach the same topic with greater depth in a more compelling fashion? In an age of instantaneous messaging, many people can’t construct a sentence, let alone write compelling web content. It’s not easy; you need to learn. Or pay someone better than you to do it. The best blog posts are often accompanied by carefully chosen imagery that helps engage the reader and illustrate a point. In my experience, lots of people are utterly terrible at this. They have an uncanny ability to pick the naffest stock images and the blurriest photos from their phone. Just stop it. Please. Posting to your seven Twitter followers won’t do a thing. Unless you have already built up thousands of connections across several relevant networks, you will need to consider other ways to get your content out there. There are a ton of tools out there such as Moz and Hubspot that specifically help monitor content marketing efforts. But those who are new to content can start small. A great deal can be achieved with just a WordPress blog and Google Analytics (both free). Content marketing doesn’t provide overnight results. It takes time. The purpose of creating and distributing useful content is to engage prospects and convert them into customers after months or even years. For business owners, it is simple — they need to prioritise content over any other website considerations. They need to assign manpower, budget and they need to commit — a half-hearted effort won’t get anybody anywhere. They need to understand that a website which doesn’t provide quality, relevant and compelling content is of very limited marketing value in today’s digital landscape. For frustrated web designers like me, we must realise that it is our responsibility to educate. Content is (and always will be) king. So start spreading the word.